I feel like a blogging machine this week! 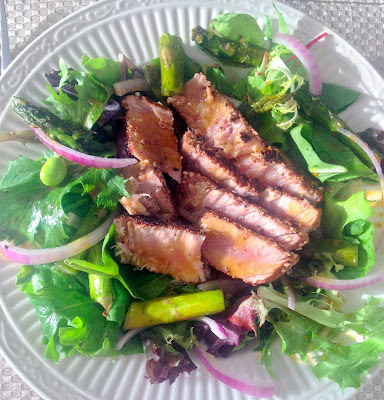 I've been so excited about all the tasty new recipes that I've tried - and sunlight past 6pm! I'm finally seeing the light at the end of the tunnel - or day! - and could not be happier. Hopefully this will continue and you'll see more frequent posts heading your way. Note: There are a few non-standard ingredients in here, but they can be purchased at your grocery store (Marsh, for me) and found in the International food aisle. The wasabi paste was about $2.50 and the 5-spice about $3. I found rice vinegar for about $2 at Trader Joe's. If you don't want to purchase all those ingredients because you're afraid you won't use them again, I would highly encourage you to get the wasabi paste and rice vinegar. The dressing is unreal and so worth it! *Preheat oven to 400 degrees. Toss asparagus, 1 teaspoon olive oil, salt and pepper in a pan. Roast in the oven for about 20 minutes. 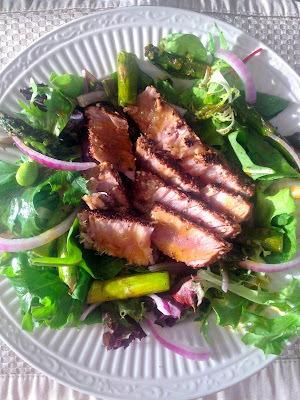 *When asparagus has about 5 minutes to go, heat a grill pan or sear pan on high. Spray grill/pan surface with cooking spray. 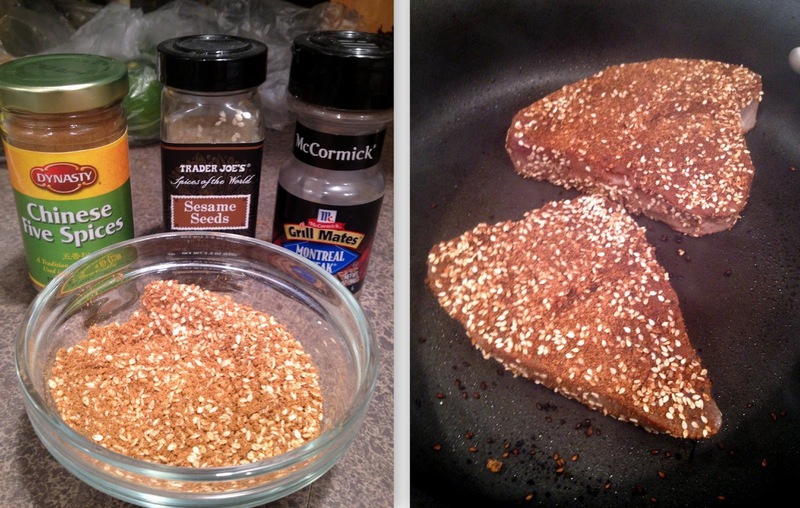 Then, season tuna steaks with sesame seeds, Montreal seasoning and five-spice powder. *Add tuna steak to the hot cooking surface and sear tuna 2 minutes on each side. Remove tuna from heat. Slice or cut into chunks, depending on your preferences. 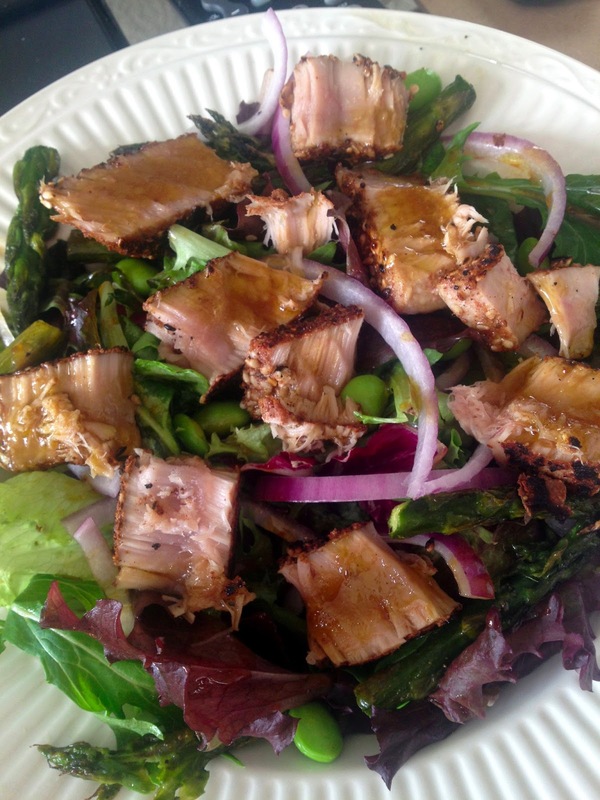 *Combine greens, roasted asparagus, red onion and edamame on salad bowls or plates. *In a smaller bowl, whisk wasabi, vinegar and soy sauce. Whisk in oil to combine dressing. 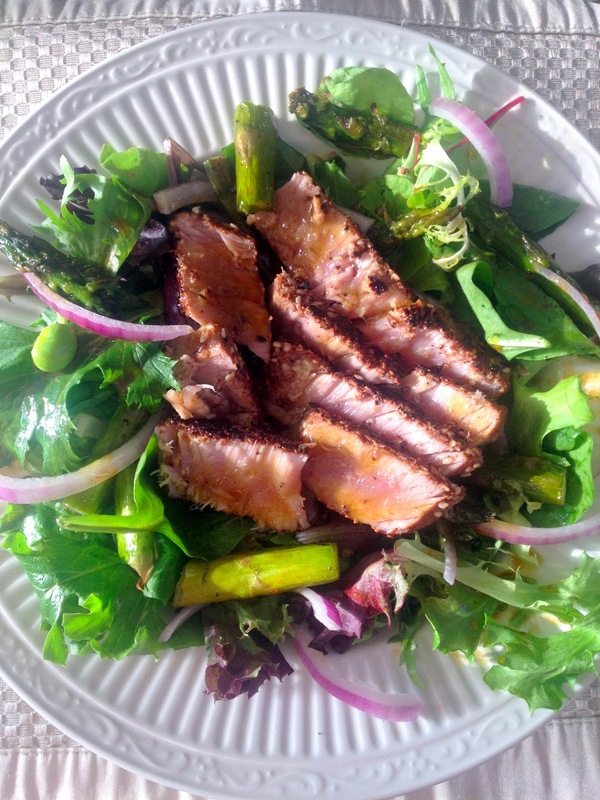 *Top salad with tuna and drizzle with dressing. Enjoy immediately!